Menopause is often accompanied by symptoms such as high blood pressure and night sweats. While these conditions might initially appear to have little in common, when experienced during menopause, they are often caused by the same thing - hormonal fluctuations. Take a look at the information below for advice on treating these menopause symptoms. Scientifically known as “nocturnal hyperhidrosis”, night sweats are episodes of sweating that occur during the night. When blood is pushed against the artery walls during its circulation of the body the sensation is known as “blood pressure”. However, if this pressure becomes too high, or remains high for extended periods, it can lead to potentially hazardous health conditions. High blood pressure is a serious condition that can lead to heart disease, heart failure, stroke, kidney failure, and other health disorders. In general, women are at a lower risk of encountering high blood pressure than men. However, due to natural hormonal fluctuations, menopausal women can sometimes prove to be the exception to the rule. Why Do I Suffer from High Blood Pressure and Night Sweats during Menopause? During a woman's reproductive life, the protective properties of estrogen typically ensure that she is at a decreased risk of developing high blood pressure. Estrogen helps keep blood vessels flexible and moderates other hormonal symptoms that cause high blood pressure. However, during menopause hormonal fluctuations cause dramatic shifts in estrogen levels. This reduced rate of estrogen leads to not only menopause symptoms such as night sweats, but also an increased risk of incurring high blood pressure. This unique hormone interplay means women going through menopause are at greater risk of developing high blood pressure than men. The primary cause for night sweats during menopause is also thought to be hormonal fluctuations. A significant reduction in estrogen levels causes the body to falsely perceive a rise in temperature and order a rapid heat drop. The consequence is known as night sweats. 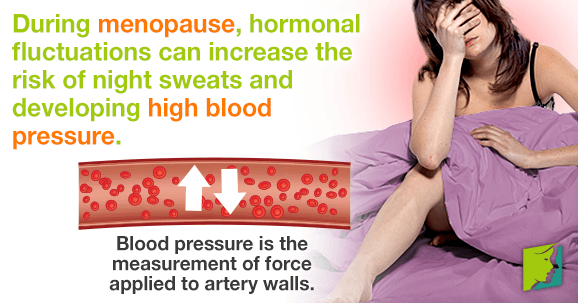 What Can I Do about High Blood Pressure and Night Sweats during Menopause? Because hormone fluctuations are also to blame for night sweats, many of the above treatments might also prove effective when combating the symptom. However, women might also consider wearing looser bed clothing, keeping a window open, and avoiding spicy food before bed. Read more specific information on the treatments for night sweats and high blood pressure during menopause. Can Stress Lead to Night Sweats? Read on to learn how stress causes night sweats and why the condition should be taken seriously. By adjusting your habits and environment over just five days, you can banish night sweats. Educate yourself on the truth behind these fiery symptoms of menopause.